There are multiple ways of placing orders from the DOM display. NOTE: when you place your cursor over that column, it changes to show what order you're about to place. By default, the order type is determined by where you're placing the order - for example, if you place a sell order above the last traded price, it will place a limit order. A sell order below the last traded price will be a stop market order. That is controlled by a setting in Settings / Trading / General - DOM - Automatic Order Type. You can also force the order type by pressing an holding to make it a Limit order, or to make it a Stop order. Holding both and while placing the order will place a Stop Limit order. The quantity of the order placed will come from either the Trading tab in the ribbon menu or from the highlighted quantity in the Quantity Tabs. Other parameters such as TIF and Special Instructions for the order will also be set as indicated in the Trading tab in the ribbon menu. 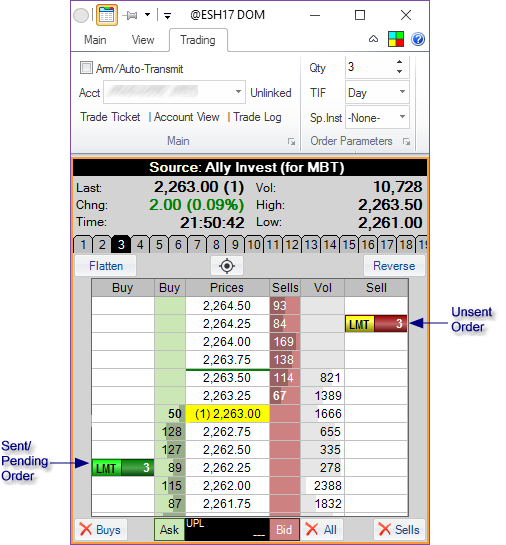 Depending on the Arm/Auto-Transmit setting in the Trading tab of the ribbon menu, after the mouse click the order that is placed will either be sent immediately to the broker (if Auto-Transmit is selected) or placed as an unsent order. 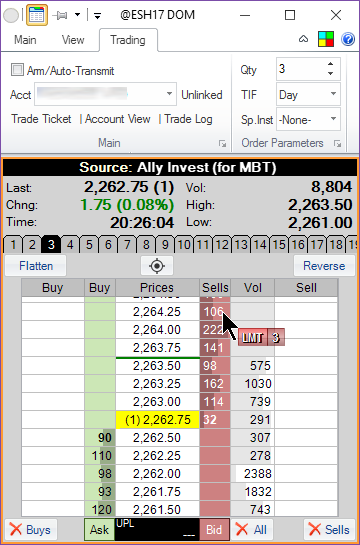 Unsent orders are shown with yellow halves, and need to be confirmed/sent to the broker. 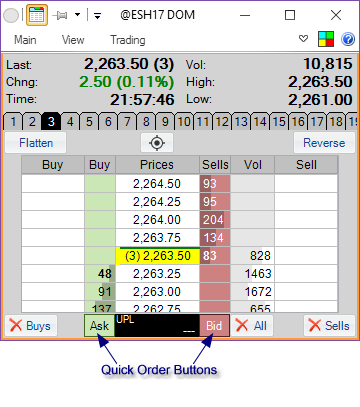 There are two colored buttons placed underneath the Buys and Sells columns - the Quick Order Buttons. Pressing the or key will change the button captions accordingly to indicate which order will be placed when clicking on the button. Each button / action can also be assigned a Keyboard Shortcut. The Flatten button, when pressed, will place the market buy or sell order in order to exit the currently held position. The Reverse button will place the market buy or sell order(s) that would both exit the current position and take the opposite position with the same quantity.